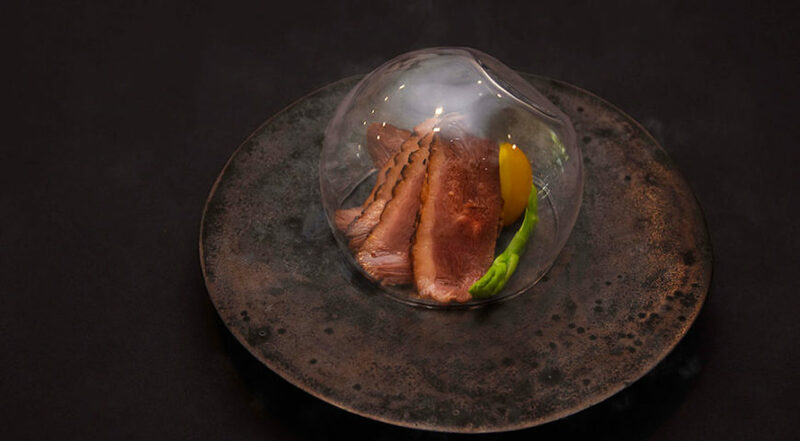 This delicious invention of our chef blends together the fragrances of duck meat with the savoury tastiness of” Bottarga”, an Italian delicacy made out of salted fish roe. The final outcome is an original combination of land and sea flavours that is excellent for guests that wish to try something new. If you prefer a more traditional seafood second course, we suggest our Sautéed king prawn[link]. Duck meat is very appreciated both in Japan and Italy because of its tender consistency and flavourful taste. Not surprisingly, there are many recipes in Japan and Italy with duck meat as main ingredients. For example, “Kamo Ro-Su” (pan-roasted and marinated duck breast) and the very famous “Anatra all’arancia” (Duck in Orange sauce). Mullet roe is another food that is common to Japan and Italy. “Karasumi” is the Japanese equivalent of the Italian “Bottarga”. Highly priced, “Karasumi” is one of the three Chinmi (rare tastes) of Japan. “Bottarga” has a consistency similar to ham. Being possible to make “Bottarga” from different species of fish (even though today it is generally utilized tuna roe), its taste could vary depending on the fish utilized. Coming to wine pairing, a still white wine like “Vermentino” pairs well both with “Bottarga” and duck. Try our “Argiolas” from Sardinia.